Several months ago my mom and I went to Joann's Fabrics to look for wedding DIY project supplies. While we were there, we found a cute basket that we could use for my flower girl. It was perfect in that it wasn't the cheesy, expensive, traditional ones and it was in silver which happens to be one of my colors. We proceeded to buy the basket and many other items. When we were paying, we realized there was no price tag, no other ones in the store, and were left to figure out how much to pay. I was expecting to pay around $12 to $16. Low and behold, this was a basket from Christmas and went on clearance a long time ago and this was the only one left. How much did I pay for this basket? Answer: less than $3. And being the coupon finder I am, I had a 40% off my entire purchase for the day, so my basket was less than $2. Awesome score. My mom took the basket home to spice it up for the wedding as my flower girl is a princess, so we my mom had to work her magic. The outcome....I am in love with it. I think Miss B will love it. What do you think? Let me start by saying that I have the best future mother-in-law. After talking to my future-in-laws with Rory, we picked out rehearsal dinner location, The Country Club in Gardnerville, Nevada. It is basque food and can please everyone. Rory and I recently did a tasting of our own there, and we were pretty excited about it. My future mother-in-law started working on the invites while I gathered the addresses for her. She went to Paper Moon to have the invites custom made. 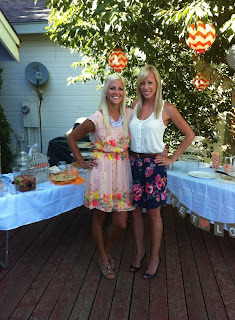 My Maid of Honor and I also went to Paper Moon for bridal shower invites that I revealed sometime ago. Love the details. The back card stock looks like wood with fits our romantic theme and is part of our centerpieces. Did your in-laws send out rehearsal dinner invites? This weekend was lots of fun for me, but I realize I am getting old. I am fast approaching the Dirty 30 and I am getting tired. Back to the funness (not even a word and I don't care). Saturday I went to Stacey's bridal shower and it was beautiful. Her Matron of Honor and Maid of Honor did an amazing job. Here are the lovely brides-to-be. Then Sunday the ladies went up to Lake Tahoe for some fun in the sun....lots of fun in the sun as in I have a slight sunburn. I did use a ton of sunscreen with the wedding coming up and all, but I still got burnt. That is where my aloe drink comes in. Heather showed Stacey and I this aloe vera drink. Sounds gross, but it was really good. Plus it has aloe chunks in it and I loved it. If you like Boba drinks, then this is for you. More on this in a second. 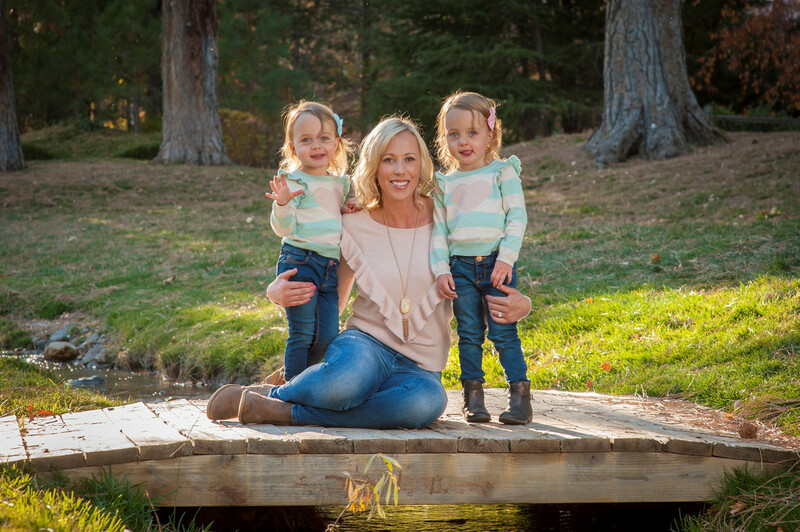 See how much fun the ladies had in Tahoe. And here is the yummy aloe drink. It is called Alo. By far the best flavor so far is the watermelon and peach. In heaven, but I forgot to bring one into work again. Total bummer. Go buy this stuff, it helps with tummy aches, sunburns, etc. Now I am just recovering from my amazing weekend. Next up for this weekend, the Celebrity Golf Tournament in Tahoe and then a weekend of relaxation. I have nagged asked Rory many times to look for his groomsmen gifts. I offered inundated Rory with several of my ideas courtesy of Pinterest because that is where I was looking for my bridesmaid gifts. Sorry maids I won't be posting my gifts on here until after the wedding. And I know only one of Rory's groomsmen has Facebook and I doubt he will be looking at this blog. All images personal, but he got them from the Etsy seller, Twisted River Clay. You can personalize them, order them in bulk for anyone, and pick the colors. Awesome gift. Plus they are really substantial! This weekend we made the five hour trip to Elko, Nevada, to celebrate Rory's grandmothers passing. She passed away almost a year ago (July 11, 2012 to be exact), so it was fitting to have a memorial/celebration for her this last weekend. Several family members came up from Arizona, Las Vegas, Reno area, Utah and further. Friday we made the trek, but made a stop in Winnemucca, Nevada for amazing basque food at The Martin Hotel. This place is amazing. I had the ribs (they were a special), plus clam chowder, salad, green beans with ham, red mashed potatoes, some yummy chicken dish, fries and lastly bread pudding. Dang, that makes me sound like a fat kid. So good, I don't even regret it, but my wedding dress body probably does. Did I mention the former BEST Niners coach, George Seifert went there before he passed away? Epic. Then we continued the trek up to Elko. We arrived Friday night around 11 pm. Saturday we had the memorial at the cemetery and a luncheon to honor Grammy. It was a great day. Finished the day up at families hotel room for dinner. Who brings the entire kitchen stock on a vacation? They do, and it was amazing. We went to the local basque festival in downtown Elko. They have games (ax games, heavy lifting competition, dances, etc.) and yummy drinks kalimotxo which is red wine and a splash of coke. I have never had one, but this weekend I did, and they are so good. Also, might have had a picon punch or two. Sunday after having a delicious breakfast, we went up to Lamoille Canyon. It is in the foothills of Spring Creek, Nevada. It is a must see. Take a look for yourself. Breath taking. I would recommend going to see it if you are in the area (Nevada/Utah/Idaho) area. I can't wait to go back and hike the trails up there. 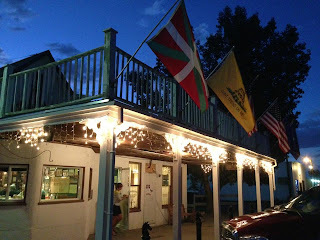 Then we took the long 5 hour trek back, but not before stopping in Winnemucca again, for food, but not basque. This time was Mexican. Until the next trip. I miss shopping. Yes I probably have a problem, but it seems like all I shop for lately is wedding stuff which is fun, but I want to buy myself something. So this weekend I did....but only because it was on sale. Have to justify it somehow. I only bought an outfit that I can wear anytime and to work. I had to throw the in work there, so I could again justify it. It was buy one, get one 50% off. So I bought a floral skirt and white dressy tank top. I can't find a picture of the top, but it is similar to the one shown, but softer, white and is a partial button-up. Then I was looking for a dress to wear to my friend Stacey's wedding and I shopped at my new favorite store, Altar 'd State I found a dress that would go with her country theme. Now just to buy some cowboy boots in Elko this weekend. I must have them, right? I just absolutely love it. I got it in the mail yesterday. I do love getting packages and they are coming in like fire right now. I also bought a clutch to go with it since it was buy one, get one half off too. Sadly, well maybe not for me, but for you, I bought the last one, so you have to wait to see it when I take and upload a photo. What have you bought lately? I have lots of fancy wedding stuff, but not as much fun stuff. Back in April, I bought a cake topper on Etsy. Big mistake. I have bought several items on Etsy and never had any issues until I purchased a topper from CrystalLuxeGalore. Her account has been suspended for failing to send several brides their items. 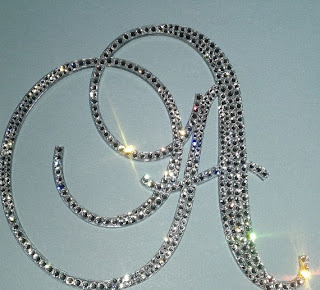 I wanted a monogram cake topper with crystals. Simply enough. Here is the topper I bought, but with a B instead of an A. She was clever enough to not respond to me or others until after the 45 day mark, so we couldn't file anything with PayPal. I had to jump through hoops, write my credit card company a letter and documentation after filing a complaint and I am still waiting to get my money back. I filed a complaint through Etsy, hence why her account is suspended right now. She said after over a month of me contacting her that she would refund my money and still nothing. So I took matters into my hands and made my own. How hard could it be? Not that hard. 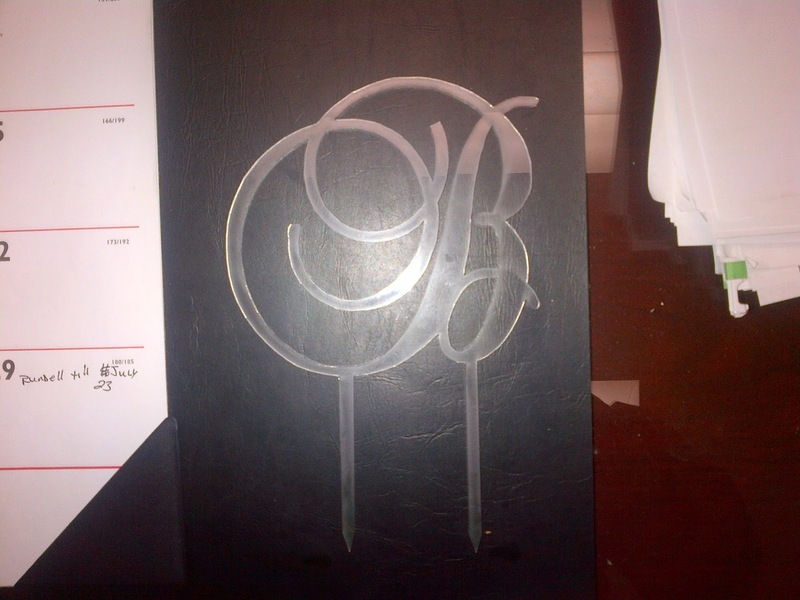 My dad has this fancy new machine at work that cuts glass, metal, plastic, acrylic, etc. So I asked him to cut me a B with photo inspirations I sent him. Here is what he made for me in 5 inches and 6 inches. So I headed out to Michaels and searched for crystals. They have all sorts of looks from cheap to super expensive. Since I want to use this in my child's (future child that is) room, I decided to spend extra. 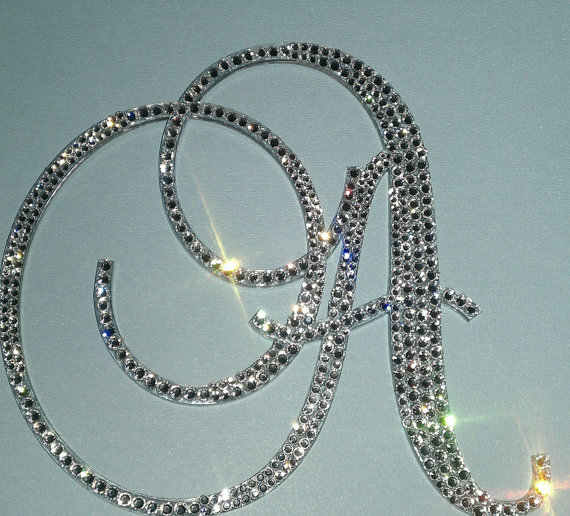 I used the Create Your Style Swarovski Crystal Elements in 3mm, 4mm and 5mm. I also purchased the glue. Here are the crystals, but not in the right color. I used plain crystal. I really recommend using the glue. It has one side where you can pick up the crystals and set it on the item of your choice. Made my life easier and this was one of my favorite DIY projects. So without further ado, here is my cake topper.